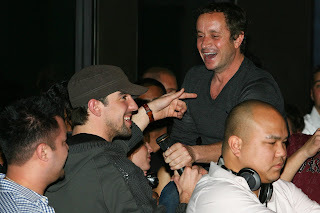 Pauly Shore greets Michael Phelps at the DJ Booth with DJ Five. Thursday night at TAO Las Vegas 1/1/09 saw olympian and world record holder Michael Phelps heading to TAO for a night on the town on day one of 2009. TAO was throwing its annual "Hungover and Broke" post New Years eve party, a New years Eve celebration for locals who were working on the actual event. The gold medal guru arrived at the Asian Bistro at 10pm for a dinner with 20 family and friends dining on Chilean Sea Bass, Kobe Beef and Chicken Pad Thai among other things. Afterwards the group hit the nightclub where they had a large corner dancefloor table. Tao did a special countdown to re-create the NYE magic and had TAO friend Pauly Shore do the honors. Pauly got on the mic and go the crowd going., giving shout outs to Michael Phelps amd even getting him to come to the DJ Booth and wave to the crowd of fans. Next to arrive was former NSYNC member and "Dancing with the Stars" finalist Lance Bass. Lance arrived shortly after midnight with co-star Cheryl Burke and and fellow DWTS contestant Maurice Green. The group of 12 took a corner dancefloor table and rocked out to the sounds of DJ FIVE, especially Cheryl who stood on the Banquette to show off her moves to everyone. Sitting next to them was actress Mena Suvari who arrived with fiancee Simone Sestito. Mena had an entourage of five and was returning to TAO for her 2nd night in a row having stopped by on NYE as well. 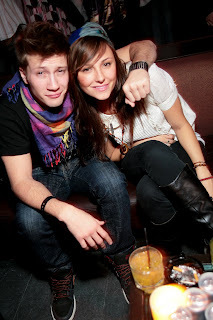 Up and coming actress Briana Evigan arrived with her beau and shared a vip table with 3 friends. Arriving at 230am was STAIND lead singer Aaron Lewis who arrived with members of his crew. Also spotted at TAO was "Dr. 90210" co-star Dr Gary Motykie.